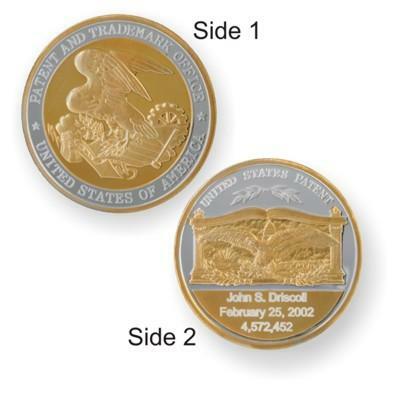 A beautiful, personalized way to honor the award of your patent: A specially minted commemorative coin. Crafted in .999 fine Silver, highlighted with pure 24k Gold ... 50mm (1.97 inches) in diameter and almost 2 ounces. Your proof quality collectible coin will arrive in a handsome blue leatherette box, bearing our own certificate of authenticity, attesting that this commemorative piece has been minted with the highest degree of workmanship and attention to detail. Due to the increasing cost of precious metals, we can no longer offer the limited $20 discount on coins.